Our Organic Woolly Bolas are little clusters of wool that provide an optimum fluff and density for a pillow. Our most popular pillow features an inner zippered case to adjust your wool fill as you wish and an outer zippered case in our beautiful organic cotton double knit damask floral ticking. All covers and fill are machine washable. Wool fill is Certified Organic by Oregon Tilth. Made in the USA. Our premium grade Kapok is a naturally silky fiber from the Kapok tree. These trees grow in tropical climates close to the equator. Kapok silk is harvested from the pods that grow on the tree. This fiber is soft like down, yet has none of the allergens from down. It is both moisture and dust mite resistant. Each pillow is covered in an organic cotton sateen cover with a YKK zipper making it adjustable. An outer organic cotton zippered cover in our luxurious double knit damask is machine washable. Natural Shredded Latex Rubber is made from the cuttings of our mattresses and shredded into a fine shred for a soft, pliable pillow. Each pillow is encased in an organic cotton sateen zippered shell and then covered in an organic cotton knit zippered cover. The fill is removable for easy adjustability and more fill can be purchased if needed. The covers are machine washable. This pillow is best suited for those wanting a squishy, malleable pillow. Tencel is our latest pillow fill option for our hot new pillow! We blend the soft silky Tencel fibers with recycled polyester to create these soft clusters that cradle your head while you sleep. The clusters are made in the same way as our ever-popular Woolly Bolas, but have a softer silkier feel. As with all of our fiber pillows, the fill is totally adjustable to your liking and the Tencel/Poly knit cover features a zipper for easy fill removal. Tencel is a great fiber for sleep products because it is moisture wicking, breathable, and silky. Tencel is a manufactured fiber from Austria using 20% less water than cotton and comes from sustainable Eucalyptus trees. Kid’s protector comes in a set of 2. Organic Cotton Double Knit Floral Ticking. Zippered Closure. Oversized to allow for shrinkage. Machine Washable. Kid’s protector in Little Lamb Fabric. Replacing our 30 some year old Sealy Posturepedic Signet mattress. 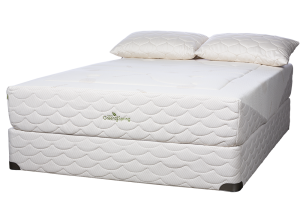 Simmons Beautyrest Classic Adamsville Comparable Mattress.